The London Festival of Architecture kicks off today. Dezeen's deputy editor Tom Ravenscroft reveals 10 of the best events and installations, featuring buildings with mistaken identities, data centres and a house in a skip. Dezeen is media partner for the 11th London Festival of Architecture (LFA), which takes place throughout June. There are 400 events taking place across the city, that aim to explore the theme of identity. APE Architecture and Design is leading a tour of London buildings that have appeared in film as buildings in other cities. The 2.5-hour tour will explore central London, taking in buildings that have been shown in Moscow, New York, Milan, Gotham City, Hong Kong and the planet Xandar. 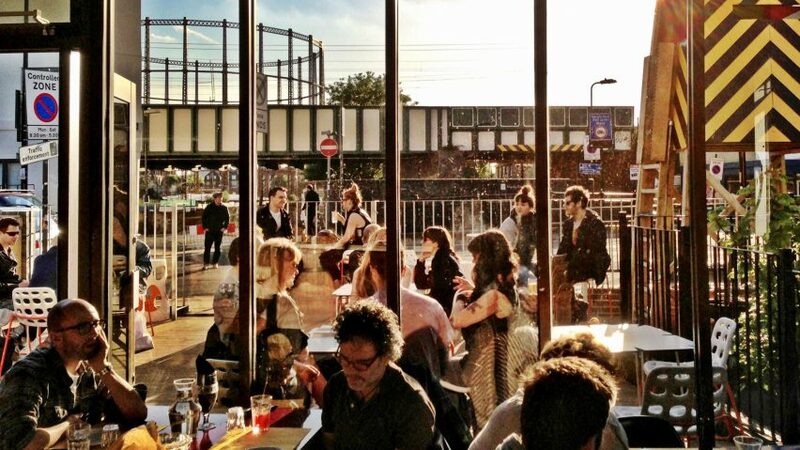 Bringing Venice to Hackney, the Ombra Altana is a installation that "celebrates identity, architecture and aperitif". Built by local architects Fourth Space and The Office for Crafted Architecture, the pavilion on the Regents Canal has a large west-facing elevated terrace for drinking spritz. A series of Negroni Talks will take place during the festival, with the highlight set to be Where's the punk in architecture? Speakers include Tim Abrahams, Piers Taylor, Charles Holland, Shumi Bose and Caz Facey. Skip Gallery's latest installation will see artist Richard Wood place a house that has been "trashed" in a skip in Hoxton Square. A series of 10 one-off public benches will be installed around the City of London for the duration of the festival. The benches are designed by architecture and design students, recent graduates and emerging practices (including Eleanor Dodman Architects, pictured), that won an open competition held by the LFA. Architecture practice SODA is organising an evening of opinions, music and screenings to celebrate concrete, which they describe as a "much-maligned building material". Speakers will include Emily Hopkins, a PhD Researcher at Royal Holloway; Kimberley Harris, architect and photographer; and Dawn Pereira, Henry Moore post doctoral fellow at the University of East London. There will also be a tour of recently renovated former brewery brutalist building alongside the Docklands Light Railway tracks in east London. If nothing else, this event is a good excuse to see David Chipperfield's recently renovated Royal Academy (RA). Held in the RA's new auditorium, the LFA's inaugural symposium will explore the "impact of architecture on the identity of a city". The day-long event will consist of two panel discussions and a keynote lecture from Mary Duggan, founder of Mary Duggan Architects. Stirling Prize-winning studio dRMM has created a film about the influence of the emigre architect. The film features interviews with 10 architects and designers, from 10 different nations, who work at the practice. Organised by The 204 Design Collective, this series of conversations, debates and workshops will explore forms of urbanisms that challenge the direct and indirect effects of colonialism. The talk aim to "challenge traditional architectural practice and discourse, and dismantle inequality in our cities". This event is for brick enthusiasts. Led by facade consultants Taylor Maxwell, it is a walking tour in London Bridge, explaining how bricks have been used in London's architecture and the history of the London stock brick. And finally, I will be leading a tour of London's urban data centres. The tours will take place in two of the key locations for the development of data storage in the city – the Docklands and the City of London.